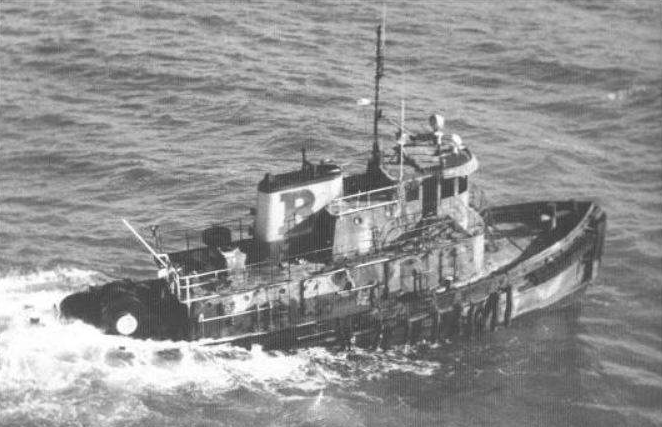 Baleen was a seagoing tug that caught fire while towing an oil barge, and sank in 170 feet of water in 1975. The Coast Guard rescued the entire eight-man crew. Built in 1923 by the Manitowoc Shipbuilding Co. in Wisconsin and launched as the John E. Meyer, the powerful 102-foot tug was a top-of-the-line workhorse that spent 40 years towing barges of iron and coal on the Great Lakes. In 1940, after being renamed Jesse James, she came under the ownership of Oglebay Norton Company. The tug was now part of the fleet that would include the doomed ore carrier Edmund Fitzgerald. The fresh water of the Great Lakes helped keep the vessel in fine condition. Sold again and refitted for service in Florida, the tug was re-named Baleen. She was sold to the New Jersey-based parent company of Boston Fuel Towing, Inc., and homeported in Bath, Maine. Towing a barge with 2-1/2 million gallons of home heating oil from New York to Boston on a rough fall day in 1975, the Baleen caught fire off Manomet Point in Cape Cod Bay. Six of the crew escaped in a life raft, with Coast Guard helicopters rescuing them plus the two who remained aboard the burning tug. Forty-knot winds and heavy seas hampered Coast Guard firefighting efforts, and the USCG Cutter Hornbeam took the Baleen under tow. Help also came from the commercial tug Chicopee to stabilize the oil-filled barge. As Captain Eric Takakjian explains in a descriptive account on ShipwreckExpo.com, the Baleen, being towed from its low-riding stern, “plunged to the bottom” almost within sight of Boston. The date was November 1, 1975. Nine days later, in a freezing rain storm on Lake Superior, the Edmund Fitzgerald and its 29-man crew went to the bottom. Though Baleen did not sink in the vicinity of Graves Light, the light is used as the point of reference for locating the wreck, 6 miles ENE of the ledge. The Baleen is a unique and exciting dive. She rests completely intact and upright, with a list to starboard, in 170 fsw. The top of her wheelhouse and smokestack rise 30′ off the bottom. The upper part of the superstructure shows evidence of the extreme heat of the fire; many plates are buckled and the interior of the wheel house was gutted. The wreck is loaded with artifacts, including numerous portholes and cage lamps. The first two divers on the wreck, Dave and Patricia Morton, recovered the tug’s large bronze fog horn and peep whistle. A lot of the ship’s fittings are lying around the deck of the tug and a large telegraph is standing on the after end of the boat deck. It is possible to penetrate the wreck in many locations. . . .
Takakjian’s essay prompted an email from Tom Blom, who described his rescue as a 19 year-old deckhand on the Baleen when it went down. BostonDeepWrecks.com, page with dive photos of the wreck. Captain Eric Takakjian, “Baleen,” ShipwreckExpo.com. “Wreck of the Baleen,” CptDave.com. Frederic A. Moritz, “Tugboat captain recalls Boston’s lost glory in today’s lean times,” Christian Science Monitor, November 10, 1983.